Battle On with DOUBLE EXP this New Year's Day! Happy New Year from the AQWorlds team! To start the year off right, login any time from 12 AM EST (midnight server time) on January 1st until 11:59 PM on ANY server to get DOUBLE reputation points from any battle or quest! Get Double REP plus extra REP plus Double EXP on member servers! You'll also find the new year's gear and the final armor in the New Year's Evolution shop! Talk to Tinsel in Battleon to quest for the free Frost King and Queen armor set and Legend-only pet! I would like to thank everyone who helped make AQWorlds possible in 2013: our testers, QA, mods, devs... and especially YOU! We could not make this game at all if it were not for your suggestions, support, and loyalty. I am honored to work for and with you all. 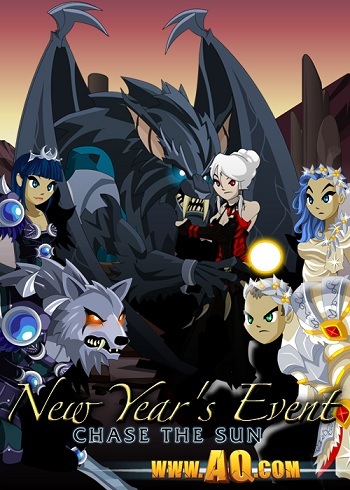 Replay Our Previous New Year's Events Now! New Year's Eve is a time to make resolutions, vows, and promises to protect those you love and care for... and if you want to see New Year's morning, you're going to have to FIGHT! Log in now to battle your way through all our past New Year's releases, and make sure that tomorrow never dies! Tinsel's Gifts Open January 1st! Chaos has been wreaking havoc all across Lore... and that includes time itself! That is why our New Year's story release arrives this Friday... but a lot is happening this Wednesday, January 1st! Tinsel's presents open, so make sure you've finished her quests before then to get the 0 AC Frost King and Queen armor sets! When the Countdown to New Year's Limited Time Shop counter hits 0:00, the New Year's 2014 Rares shop will arrive! (Evolved Fiend, Sapphire Mage, and more!) The Countdown to New Year's shop will remain in-game for another 24-48 hours to give everyone a chance to get the last few item additions. Join Us This Friday for a New Year's Nightmare! Before the new year can dawn, the sun must rise… but when no one sees the Steeds of Night and Day chasing each other across the sky, the denizens of Dwarfhold Mountain know something is very wrong! As night continues to reign, you must quest to discover why Frostmane’s nightmare has become your reality! Did you think you were done? Unfortunatly, Frostfang is pretty much slaughtering everyone indiscriminately, so regardless of which side you fought on during last week's war, you'll need to take this big guy out. /join darkwinter and talk to Yorumi or Issik to get started! And reach level 60 while you do it! Yep, it's that time again! We've raised the level cap to 60, allowing you to be even stronger and battle even deadlier monsters! If you need help leveling up, visit Yulgar's Daily Quest Board. New level 55+ enhancements will also be coming later tonight. Quibble, War Shop, & Countdown to the New Year! As promised, since the war has ended, some of the items that did not make it into the merge shop will be purchaseable for ACs from the new Darkwinter War Shop. So if you didn't get that awesome sword you wanted so bad... now's your chance! Complete your set! P.S. Thank you to everyone who upgraded to Member or purchased AdventureCoins to support our weekly releases. We are very grateful that you give us the opportunity to keep making all our games better each week. Get More Class Points and Rep Until Friday! Login any time until release this Friday* on ANY server to get more Class and Rep Points! Get 15% more on Legend servers, and 10% more on ALL other servers from all battles and quests! * When we will begin a different set of boosts until New Year's! Once the war is over... the REAL battle begins! Frostfang the Eternal Ice Dragon: a beast out of legend, terrorizing the land before man first roamed the world. Dage knows WHAT it is... Dage knows WHERE it is... but how does he want to use it? And... for what?! If you're going to survive this Frostval, you'd better make sure your stats are high and your HP potions are full! Defeat the Beast to save Frostval! 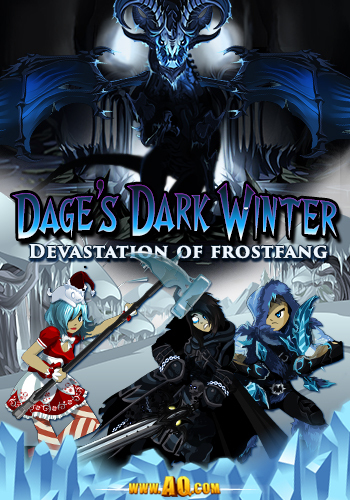 /Join darkwinter to take part in Dage's Dark Winter war! Each night at midnight, the war meter will reset and the side with the most souls collected that day will get their reward! Once the time is right (aka this Friday), Dage the evil will see his dream become YOUR nightmare! Countdown to New Year's Limited Time Shop! This Friday, the countdown to New Year's begins with the New Year's Evolution shop! As the years turn, the world around us evolves... and so does AQWorlds! The items in this shop will be inspired by legendary gear of the past. Thanks to Zoraith for the AWESOME shop suggestion! A new item will be added to the shop each day until January 1st, when our New Year's event hub goes live! Level Cap Raises to 60! DING! Level up! It's Frostval, and that means your Hero has battled for another year, and has the ability to get EVEN stronger! Yulgar's Daily Quest board will have a new farming quest or two for our higher-leveled players to tackle to help them level up! 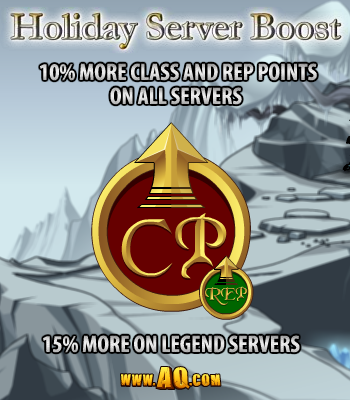 Holiday Boost on all servers! Happy holidays! From now until release, battles and quests on Legend servers will give you 15% MORE Class Points AND Rep! All other servers will get 10% more Class Points and Rep! The holidays are here, and so is Frostval! Some of the coolest (literally) gear in-game is available right now, and upgrading or bying AdventureCoins with the Ultimate Game Card is a great way to get it! Use the Ultimate Game Card to unlocks exclusive Legend features, items, storylines, and more! Find a store with the game cards near you! 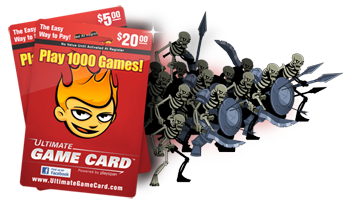 Keep an eye out for the Ultimate Game Card at stores like Walmart, GameStop, CVS, Target, Toys R Us, and more! Give the gift of gaming to all your friends... or yourself! Stand in line or get online with the Ultimate Game Card now! A lot has happened since Friday's release of Dage's Dark Winter PVP war! Make sure you don't miss any of the changes! Find the Prismatic Smog Slayer armor set in the Wheel of Doom and Destiny merge shops for a limited time. A second version of the Deorum Lance (the Bright Deorum Lance) was added to Quibble's shop. The Smog Slayer armor set drops from the Wheels of Doom and Destiny for a limited time. The drop rate for the Thanatos items from Dage's quests have been raised to 10% until the holidays are over. The Love Caster armor was temporarily removed from the shop while a sellback issue was fixed, but is back in Beleen's birthday shop now. The Love Caster armor has been changed so it cannot be sold back until January 17th (this is to prevent people from abusing the sellback issue). Certain players not being able to queue for the Frostbrawl map is being investigated now. Because many players were experiencing disconnect issues while on the "Dage's Winter is Coming" quest from the Holiday Paragon Pet, the quest has been changed. To compensate for requiring multiple map-joins, the drop rate on the required items has been increased significantly. Fight to Save Frostval - or Destroy It! 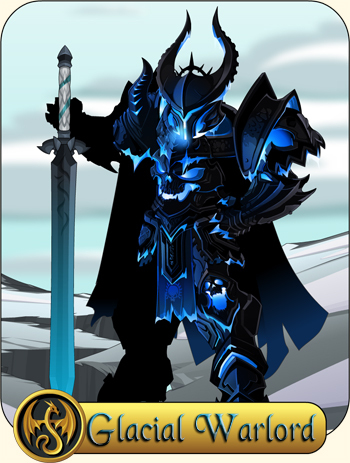 Tonight, a darkness descends over the land and threatens to destroy Frostval - a darkness named Dage! As a Hero of Lore, it's up to you to fight the forces of evil and save the holiday season! Or, if you're loyal to Dage, you can help him turn winter into the season of bleakness and despair that it was always meant to be. Dage just has a different way of celebrating! There are two ways players can fight in this war. When you /join darkwinter, you'll be able to join a special PVP map, where you can battle other players to save (or destroy) the holiday season! Or, if PVP isn't your thing, completing quests for either Yorumi or Issik the Vile will also help fill the war meter. Step it up, Evil! Good's kicking your butts! However you choose to fight, you'll be collecting the souls of the good (if you're evil) or evil souls (if you're good) that can be used to buy items in the Darkwinter Good and Evil Merge shops. But there's a catch! We'll be adding new items to both shops each day, but only the winning side will be able to unlock access to their shop's items! Some of the merge gear you'll fight to unlock! 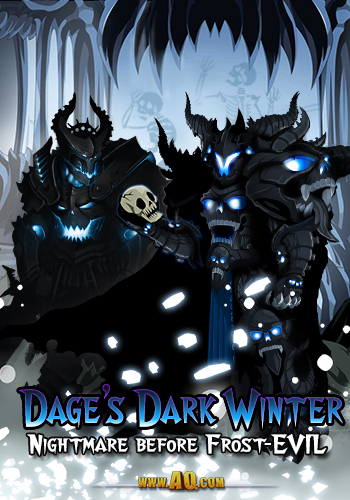 Check out Dage's Darkwinter Rare Merge Shop too! 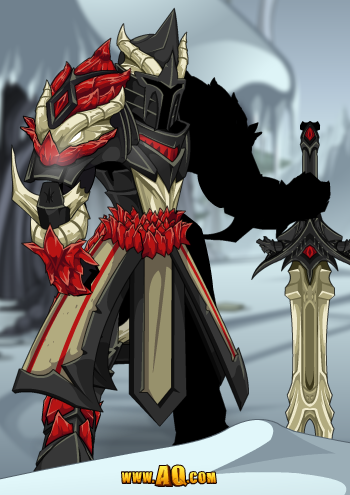 Members of Dage's Legion will be able to purchase this awesome holiday-themed Dage gear for a limited time! Holiday Paragon armor and helm drop from the Wheel AND are in the merge shop NOW! The button will be located next to the Game Size selector. If you click the button a pop-up window will appear showing a sponsor video. You can get between 1 and 25 free AC's by watching each video! These new sponsor videos are available world-wide, but not always available for every country every day. Currently, your new free AC's will not show up inside the game until you log back into the game. We recommend watching one video each day, and after a few days you can earn enough free AC's to buy something! Sometimes you can watch the same video more than once! MechQuest likes making Gold Mecha, too! We hear our competitors are charging $500.00 for golden mechs. We gilded some of our mecha models for you, but it won't cost you a dime. These don't even sell for credits! 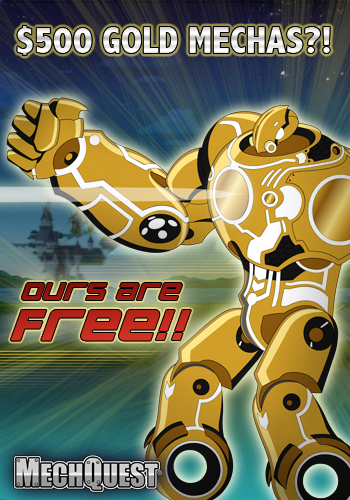 Log in to MechQuestNOW to get your free golden mechas! We like gold mechs and we cannot lie. J6's Space Shop Arrives Tomorrow! 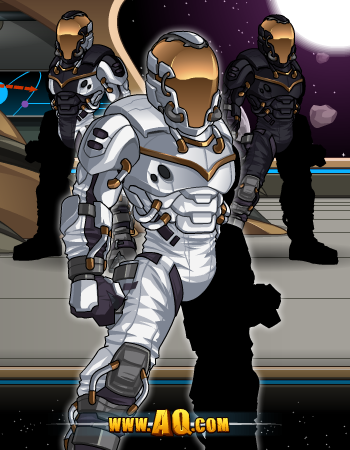 To thank you all for helping him win a trip to Space Camp, J6 (AQWorlds' lead artist and Bounty Hunter) has made a bountiful amount of space-themed gear! Check back tomorrow for more details! J6 wants to thank you! We had our holiday party at the Secret Underground Lab today, and the gifts were AMAZING! 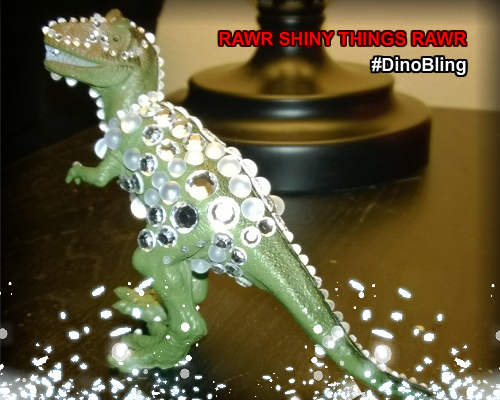 From homemade hot sauce to a can of BrutalCorn meat to Samba's Blingasaurus Rex, everyone got something awesome! 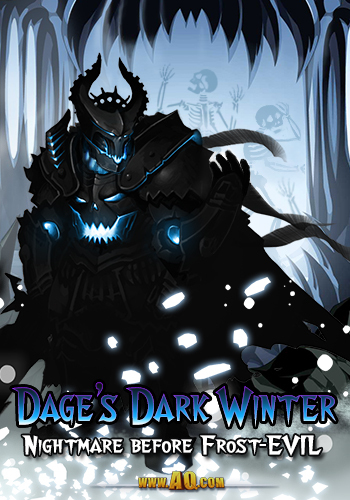 We hope you all are enjoying the holidays so far, and will join us this Friday for Dage's Dark Winter WAR! What does Frostval mean to you? Is it a time for sharing presents with loved ones? Is it to celebrate the birth of a Level 1 Healer? Is it the time for decadent desserts and bountiful feasts—all with the promise of exercising daily beginning January 1st? To me, Frostval means spreading unconditional holiday cheer, joy, and love to everyone, everywhere! Frostval came early to a group of Special Needs Kids at my former high school. Surrounded by hundreds of balloons (and an entire carafe of coffee), I working into the wee hours of the morning, twisting 55 hand-made balloon candy canes. It took me about 3 hours to make 55 balloon candy canes. Talk about super hard work with super soft balloons! But you know what? It was TOTALLY worth it! As soon as I walked into my high school’s cafeteria with my giant Santa’s bag full of calorie-free candy canes, all of the children fell in love with my balloons—and so did the adults, too! These special kids have a special place in my heart. All the warm fuzzies I felt inside me is worth more than anything else—you just cannot put a price on being a good person… with exceptional balloon animal-making skills, at that! On behalf of all the entire AQWorlds team and all your friends at Artix Entertainment, we wish you a very merry holiday season and a happy new year! Can YOU Survive Frostval in the Blighted Forest? As the snow starts to fall, heroes who have celebrated Frostval with us before grab their warmest cloaks and defrost their sharpest blades. They know that the merriest holidays bring the most brutal battles... and this year is no different! You'd better watch out, you'd better not die! Dark laughter rolls like thunder down a mountain overlooking Lore... and as the chills rise up your spine, you recognize the voice: Dage the Evil is coming to town... and it doesn't matter if you've been naughty or nice! If you want to survive this Friday, you're going to need to FIGHT! Battle the monsters of the Blighted Forest AND take on each other in PVP to earn resources for the Dark Winter merge shop... but be careful, Hero! Greed is in the air, and your fellow heroes are out to get YOU! Destroy monsters or raise more of them to fight for Dage! Blighted Forest PVP Map! (Maybe) We are going to try to get another Bludrutbrawl-style PVP map up which will ALSO drop Good and Evil Souls which you can use in the Dark Winter merge shop! 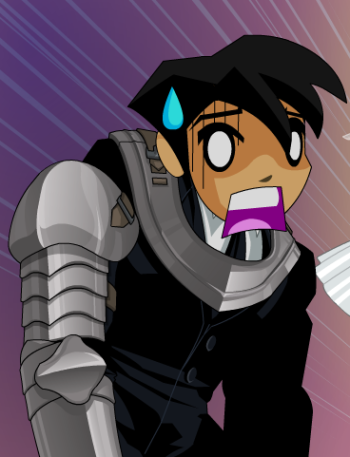 Quibble returns with a bounty of Frostval gear! Keep an eye out for art previews! The SmargSlayer Armor set arrives in the Wheels of Doom and Destiny... with a color customizable version in the Doom/Destiny merge shops! The internet is an incredible place! With it, you can play games, talk to people across the world, and access information you never would have known. One of the downsides of communicating on the internet is that it can be easy to forget you are talking to real people, and what you say or type can have a big impact. Threatening or harrassing team members or the Lab is never going to be a good way to get our attention, or to request help for an issue you are having. It raises barriers where we want to keep all of our posts with you guys open, friendly, and FUN! Our programmers make YOUR ideas happen! One of the BEST things about Artix Entertainment being an internet company is that our dream - to have you build the games alongside us - is a reality! We say you all are "the friends we've never met," and we really believe it. That's why we share so many personal stories (like Cysero's children being born, Rolith's proposal, and Artix's wedding). We WANT you to send us your ideas, pictures, and suggestions for how we can make our games better! Just make sure you are commicating with us AND each other in a safe and appropriate way when you do ! Have an account, payment, or technical issue? Email Player Support. Found a bug in AQW? Report it on the Bug Tracker. And if YOU are seeing disturbing messages (or having them sent to you), there are steps you can take to prevent receiving them on Twitter or Facebook. Yippie! I’m so super happy you came to my birthday in Frostvale! Since today is my special day, the AQWorlds team said I could release anything I want in my birthday shop. …anything, you say?! Tehehee… well you know what that means… BRING ON THE PINK RARES, baby! After asking my friends on Twitter what THEY wanted in my birthday shop, I narrowed down my favorites (and the possible ones) and created an onslaught of pink awesomeness (or madness?)! Thank you SO MUCH Submeobi! And thank you to everyone who helped decide which items should be glorious pink in my Birthday Rares Shop! 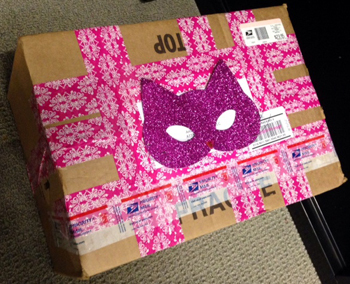 I am so blessed to have amazing friends like you =D You have really made my special day even more special, and I cannot wait to see you and your friends adorned in pink-a-licious items. Be sure to send me screenshots on my Twitter—I’d love to see them and totally flaunt them! Have a wonderful day, have a glorious weekend, and as always… battle on, my loves! 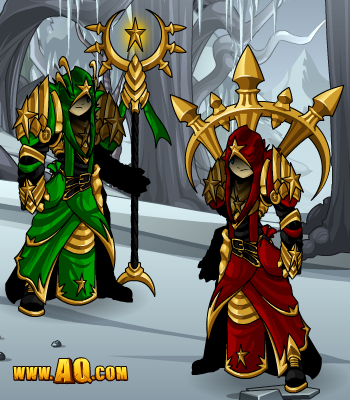 PS: The Santa Cutie helms will arrive in Quibble's shop this Friday. We've got to make sure that little guy has some PINK items for Frostval, right?! Right! Artix's Battle Wedding Event is LIVE! Log in NOW and talk to Adam in Battleon to begin this once-in-a-lifetime in-game event, as Artix's creator marries his longtime love! Friday the 13th is a nice day for a fight wedding... and we've got the ninjas, bellhops, and maniacal bosses to prove it! The BEST battle weddings have ninjas AND superheroes! Items will arrive in EpicDuel and AdventureQuest next week! Every young video game creator dreams about his wedding, and Artix's creator, Adam Bohn, was no different. You know, something traditional. White flowers… musical preludes… and the onslaught of armored groomsmen, swordfights, ninjas, Iron Man, Batman, WWE’s Jimmy Hart, and evil bellhops all taking place during the middle of the very organized, formal ceremony. Beleen's birthday shop will release tomorrow! Unleash a Blizzard of Cold-Hearted Attacks! At long last… a Class that matches your bitter cold soul: the Glacial Warlord! Glacial Warlords refuse to rely on luck or shady tactics, commanding the battlefield with massive Strength and powerful blows. Beware the Glacial Warrior whose armor is decorated with his opponent's crushed skulls. The Glacial Warlord is reserved for those who wish to dominate the battlefield with unsurpassed Strength, Dexterity, and Endurance, often arming themselves with Fighter and Lucky Enhancements. The Glacial Warlord's attacks strike with his full force taking longer per attack but dealing more damage than anyone else on the battlefield. Strike your opponent for light damage and gain a Frozen Heart Stack up to 5. Each stack of Frozen Heart increases your crit chance, haste and damage taken. A stunning attack (4 seconds) that also reduces your opponent's haste for 15 seconds. Frozen Heart stacks increase amount of haste reduction on your target. Resets Frozen Heart Stacks. Deals light damage and makes your opponent vulnerable to physical damage for 20 seconds. Frozen Heart stacks increase your targets vulnerability. Resets Frozen Heart Stacks. Strength increased by 30% and Luck decreased by 30%. Physical Damage received reduced by 30%. An invigorating shout healing the Glacial Warlord and his soldiers. Heals you and up to 6 allies if Frozen Heart is NOT present. If Frozen Heart is present, only heals you, plus an increased amount over time. Does NOT reset Frozen Heart Stacks. The force of each Powerful Blow has a chance to crush your opponent's skull dealing massive damage. Do you have what it takes to become the most feared Glacial Warlord in all of Lore? Help support your favorite online adventure game and get the COOLEST class AQWorlds has ever released! 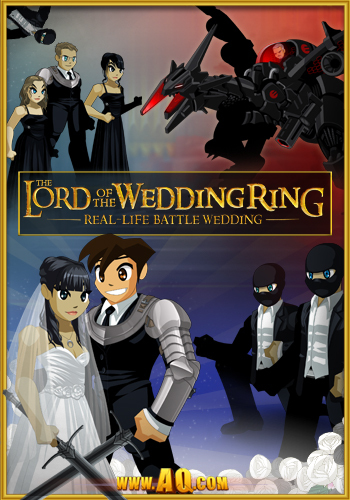 Friday: Lord of the Wedding Ring In-Game Event! Organized? Formal? Not THIS Battle Wedding! 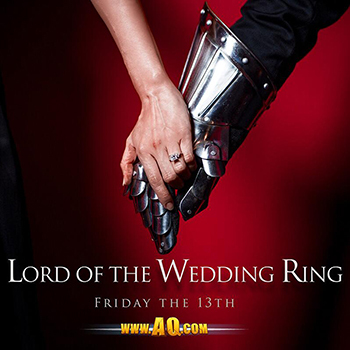 Lord of the Wedding Ring: Expect the Unexpected! Suddenly... the BATTLE portion of this most-unconventional wedding began! It wouldn't be a Friday the 13th event if SOMETHING unexpected didn't happen! Unlock the Glacial Warlord Class and Armor Set! The Glacial Warlord special offer is available now! Embrace the power of the glaciers, because winter IS coming... and WAR is about to begin! 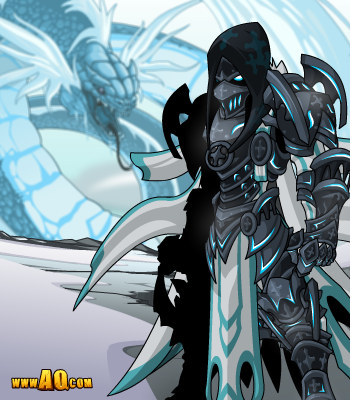 The Glacial Warlord Class ties into the theme of this year's Frostval event, which begins next Friday! Starting today,* buy any of the following packages to unlock the full Glacial Warlord armor set! When the Glacial Warlord CLASS releases on Wednesday, you'll get that, too! The full set will be available until January 1st. * If you bought any of the packages listed above after 12:01 AM server time today, you will unlock all the gear as soon as it releases! Glacial Warlord and Legion Glacial Warlord! 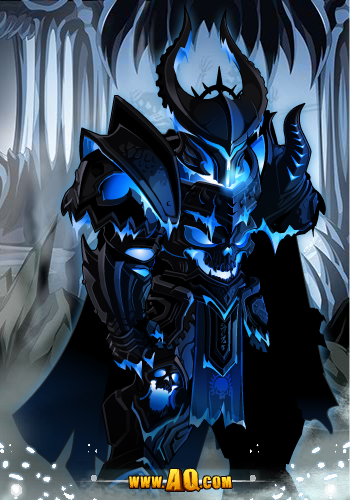 The Glacial Warlord ARMOR will be available for AdventureCoins in-game later this week. 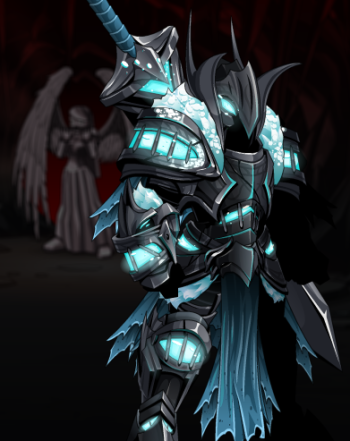 The Legion Glacial Warlord ARMOR will be available for Legion Tokens in-game later this week. Real-Life In-Game Event on 12/13/13! It’s a nice day for a fight wedding! Artix is getting married, and you are cordially invited to this one-of-a-kind special in-game wedding event starting THIS Friday the 13! Why: Artix is going to marry the love of his life… and he needs YOUR help fighting off an army of evil bellhops, ninjas, EbilCorp, copyright-infringment characters, and more as they try to crash the wedding! They save love is a battlefield… and they couldn’t be more right! All the fun—and all the puns!—starts Friday, December 13, 2013, at Sundown! Slay Bells, Beasts, and Bandits in Frostvale! Journey to Frostvale to battle through AQW's coolest holiday events now as all of our previous years' Frostval events return! 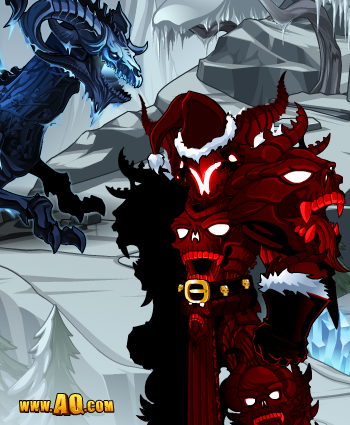 Save Frostvale, stop the Ice Symbiote infection, watch a young Empress Gravelyn experience her first Frostval, take down the ancient Questzal beast and get WAY TOO MANY presents! Are you ready for the holiday /cheer? /Join Frostval to begin battling the most coldhearted villains in Lore! Quest through the following areas to save the Spirit of Frostval, moglins... and the WORLD! Are you coldhearted enough to /equip this gear? The Subzero Berserker is available when you buy the Winter Token from Twilly in Battleon! Check out our other releases this week, too! The Black Friday and Cyber Monday shops are FULL of gear, but leave Monday! Queue up for our new PVP map: Chaosbrawl! Don't miss these important December dates! Artix's creator got married! Watch the video and learn about the in-game wedding next week! A LOT is happening in AQWorlds this month, so make sure you don't miss ANY of this year's coolest... and DEADLIEST releases! Lord of the Wedding Ring: BATTLE WEDDING! 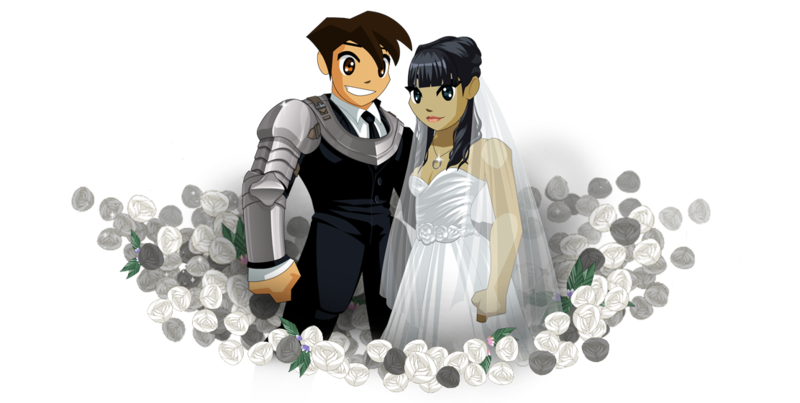 Artix and Trini invite you to take part in the MOST MASSIVELY EPIC online wedding event... EVER! 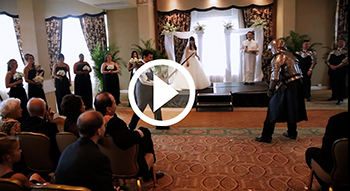 Watch the video of the real-life wedding, and /cheer for your favorite paladin and his new bride! 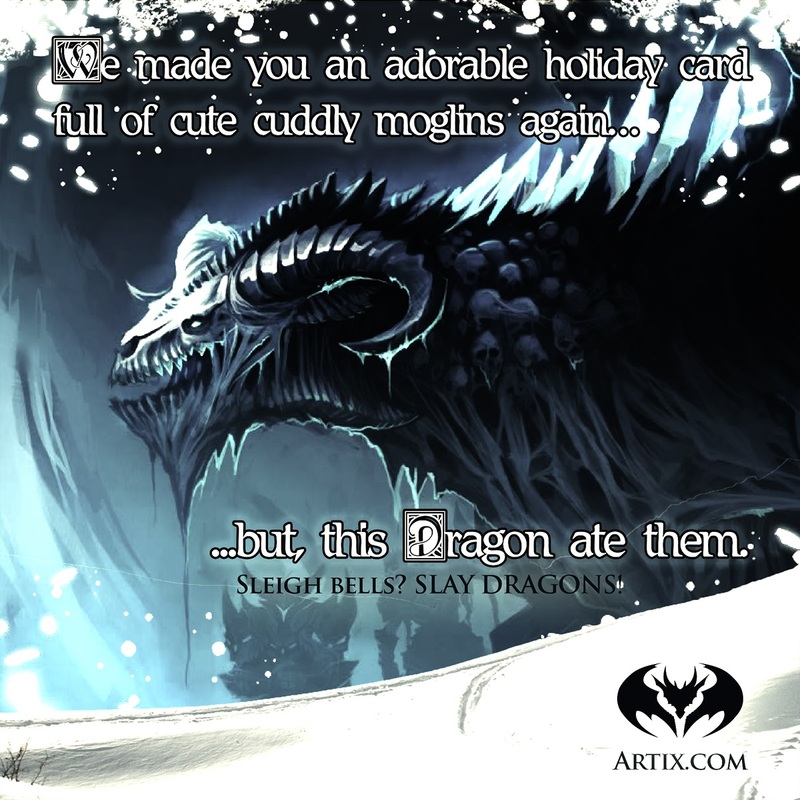 Get your 200 FREE ACs next week to celebrate Frostval AND Artix's wedding! Mid-week release: Dage's Glacial Warlord Class! One of the COOLEST classes yet! Prepare yourselves, hero, because you WILL need to fight this winter, and your enemies are... EACH OTHER! 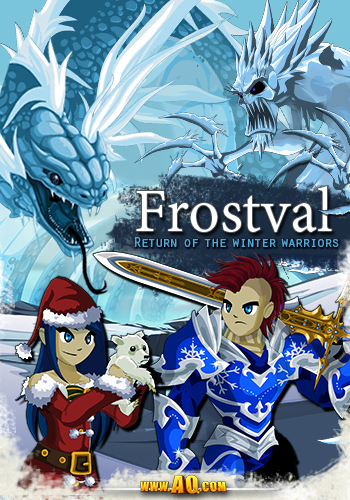 There will be single-player and PVP versions of this year's Frostval event! Dage's Nightmare Before Frost-EVIL event will be one you will NEVER forget... IF you survive!